For most of us, the very mention of Assam conjures up an image of lush tea gardens sprawling over vast stretches of the state. Assam is the world’s largest tea-growing region, and its tea has gained global prominence for its strong flavour and bright colour. About half the workforce in Assam’s tea gardens is women, as their nimble fingers are considered better for plucking the leaves. But what often goes unnoticed is the hard work it requires and the accompanying health risks. The plucking process is a highly repetitive task, involving long hours of hand work. “Pluckers work for over seven hours a day, with an hour-long lunch break and a 10-minute drinking water break in between their shifts,” explains Nandita Bhattacharyya, associate professor at the College of Home Science, Assam Agricultural University (AAU), Jorhat. 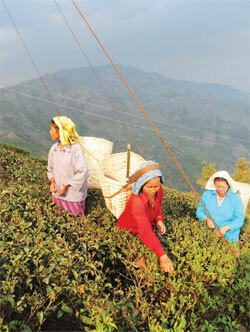 The tea-plucking basket further aggravates the burden of work as workers have to carry heavy load throughout the day. The problem could soon be resolved as a worker-friendly basket, aimed at reducing physiological stress of the workers and increasing their work efficiency, is likely to hit the market. The new basket has been designed by the College of Home Science, AAU, and funded by the National Tea Research Foundation (NTRF). The initiative followed an NTRF-sponsored study in 2003 on “posture assessment of workers in performing different activities in tea gardens”. The study highlighted that the tea-plucking basket is a major reason for various health problems faced by women working in tea estates. The bamboo basket traditionally used by pluckers is strapped to their back, the belt of which rests on their head. The full basket, which weighs about 5 kg, is emptied into a bigger basket. Throughout the day, the big basket is loaded four to five times. When a shift gets over at 5 pm, a worker walks several kilometres to deposit the tea leaves, carrying the big basket—a load of at least 20 kg—on her head. This is much more than the permissible limit of 10 kg, prescribed by the National Institute of Occupational Health and Safety. Moreover, the entire load falls on the head and neck. “This exerts pressure on the spine and back and often results in neck and back pain. The workers also have difficulty sleeping at night because of the pain,” Bhattacharyya says. “It becomes difficult for us to continue working once we develop body pain, more so because we are paid minimal wages and do not have health insurance,” says 38-year-old Sumi Orang, who works in Hahchurah tea estate in Sonitpur district. The new basket was conceptualised keeping in mind the ergonomics—the body structure of the workers and their working conditions. “This basket fits the back curvature of the women, which keeps it in place unlike the existing round basket,” Bhattacharyya says. The “tapering shape” also allows easy movement through the bushes. The basket is made of cane and has more capacity—it can hold up to 8 kg of tea leaves. But since it is loosely woven, its weight is almost as light as the bamboo basket, which is more compact. The new basket also allows passage of air and water during the rains, which ensures that the leaves are not damaged. 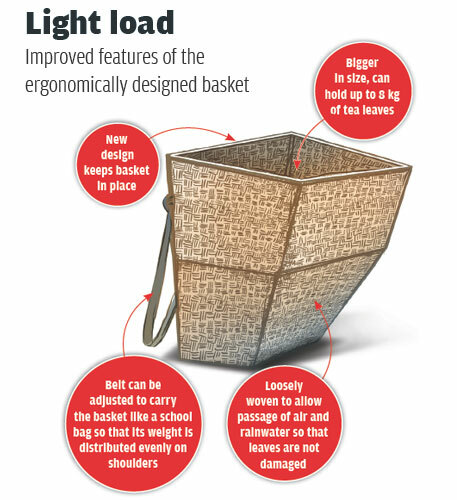 Its belt can be adjusted to carry the basket like a school bag so that the weight does not fall on the head but is distributed evenly on the shoulders (see ‘Light load’). Bhattacharyya and her team conducted initial trials of the new basket in September-November of 2004 in Silikha tea garden in Jorhat district. After that the design remained at a discussion stage for further improvements. During the trial period, the heart rate, cardiac cost (strain on the heart during work) and muscular pain of the workers were monitored and the results were compared to the three parameters while using the traditional basket. Bhattacharyya says muscular stress on the head, neck and upper back as well as pain in the buttock reduced to a great extent while using the new basket. Muscular pain reduced by 60 per cent. The average heart rate was recorded as 96.26 beats per minute, compared to 102 beats per minute in case of the existing basket. The basket is now ready to be manufactured for commercial purpose. Researchers are also re-designing the bigger basket for the plucked leaves. While the existing basket is priced between Rs 100-Rs 300, the new one will cost Rs 650-Rs 700 due to design modifications and use of skilled labour. But the price is likely to reduce if it is purchased in bulk. “It will be a win-win situation for both tea garden owners and workers. Improved health of workers will result in more output for the tea garden,” Bhattacharyya says. Tea garden workers who tried the new basket are eager to use it. “It will help us pluck more leaves but would not strain our back. We hope the new basket gets introduced in all tea gardens soon,” Orang says. Tea garden owners are interested too. “We will approach the university for some baskets,” says Pankaj Gogoi, director of Khuwa tea estate. “If it can ensure workers’ health and improve productivity, there is no reason not to use it,” he adds. Vigyan Prasar, an autonomous body under the Ministry of Science and Technology, has expressed interest to promote the product. Researchers hope entrepreneurs would come forward to develop the basket commercially and create a manufacturing unit as it will generate employment opportunities, besides addressing the health problem of tea garden workers. It has been a pioneering work in regard to the tea pluckers' health and introduction of ergonomical considerations in common implements used in the tea industry. More of this kind of work and design innovations are sure to come in near future.